Luxury Experience Magazine readers are in for a treat from Switzerland this month as Chef Ivan Gotfredsen of La Vetta at the Tschuggen Grand Hotel in Arosa graciously shares his tempting four-course menu. Danish-Swiss Chef Ivan Gotfredsen has honed his illustrious career in Italy, Switzerland, and Ireland working at some of the top hotels and restaurants including the Baur au Lac in Zurich, Gstaad Palace, Kempinski Grand Hotel des Bains in St. Moritz, and the Carlton Hotel in Kinsale, Ireland before joining the luxurious Tschuggen Grand Hotel in July 2007. 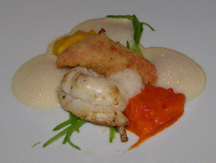 Edward F. Nesta and I stayed at the Tschuggen Grand Hotel in January 2008 and had the pleasure of experiencing Chef Ivan Gotfredsen's tasty cuisine at their restaurant La Vetta during our stay, and asked him to share his recipes from our tasting dinner. * The term brunoise is to first julienne the vegetables, turn them 90°, and then cut into cubes. Method: Glaze the shallots brunoise with the olive oil and add to the risotto rice. Gradually add the vegetable gravy a little at a time. Finish the risotto by adding the butter, Parmesan, mushrooms, and herbs. Slightly brown the rabbit confit and put it in duck fat with garlic, thyme and rosemary. Bake it in a convection oven for 80 minutes at 120°C (250° F). Remove from the oven, and slice the meat from the bones. Method: Mix the olives with the olive oil and make a paste. Skin the fillets and spread them with the paste. Brown slightly and cook slowly. Place the cauliflower in a bag with butter, salt and pepper, and steam in a 100° C (225° F) oven for 50 minutes. Add cauliflower purée. Use the cauliflower florets as a garnish. Mix the beetroot purée with the cauliflower purée. Method: Cut the lobster tail in half and brown slightly for 1.5 minutes. Marinate the cracked lobster and bake it with oil. Method for the sweet red and yellow peppers purée: Slowly braise the sweet peppers in butter until they are soft. Season to taste with salt and pepper. Method for sweet pepper garnish: Roast the sweet peppers in a 240° C (450° F) oven for around 10 minutes. Remove the skin from the pepper and cut the pepper into small cubes. Add to the pepper purée. *The recipe uses Gruyère Poulard, which is a region in Switzerland. Method: Roast the poulard breast. Glaze the onions and garlic, and add the lentils. Infuse with vegetable gravy, rosemary, and thyme, and reduce the gravy. At the end, add duck liver, herbs, butter and olive oil. Read other articles on Tschuggen Grand Hotel and Arosa in the Destinations, Hotels and Resorts, Restaurants, Spas, and Adventures sections.